SAN RAFAEL, CA--(Marketwired - Jun 25, 2015) - Scansite, the leading provider of 3D scanning, inspection and reverse engineering, has posted a case study highlighting its innovative work with Stanford University to provide high-quality 3D scans of the Rodin sculptures at the Cantor Museum, which has an extensive artwork collection, including a collection of Rodin bronzes that is among the largest in the world. It was here that art, and specifically Rodin's hand sculptures, was used to teach students how to diagnose what they saw, since many of the Rodin sculptures depicted disfigurement and look like some hands being treated in surgery. 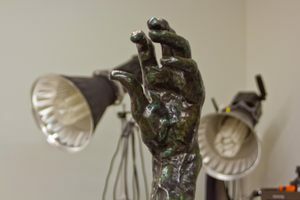 Stanford's Division of Clinical Anatomy was tasked with scanning the sculptures, adding CT scans of actual patients with the same conditions as the Rodin sculptures, and superimposing those CT scans inside the hands for a three-dimensional view for students. This is called Augmented Reality (AR). The team needed a scanning provider with capabilities and precision expertise to get deep inside of the Rodin sculptures. To realize this cutting edge dream, the organization brought in Scansite, with its expertise, experience and attention to detail necessary to cater to museums, cultural artifacts and priceless sculpture projects like this one. "3D scanning technology is improving over time but to get an accurate representation, especially with subjects as detailed as these, you need very high quality," said Dr. W. Paul Brown, Consulting Associate Professor at Stanford University, who played a lead role in the project. "In addition to the fact that they seemed to be the only ones capable of achieving our goals, Scansite was enormously patient and helpful with our inquiries. The results were extraordinary." According to Matthew Hasel, Clinical Anatomy Production Manager, Stanford University, "Scansite has the detailed experience we needed and a fantastic reputation. They're known for museum quality work. Their expertise and experience made it possible for us to be comfortable letting them handle things and assured us from the start that we'd get great results. Scansite was a piece of cake to work with and delivered exactly what we needed. The project could not have been done without them." To read the full case study and access a link to a video, visit http://j.mp/rodincase. "We were honored to be chosen and excited to be part of this cutting-edge project," said Lisa Federici, CEO of Scansite. "Working with such a forward thinking team was a pleasure and I love the fact that the findings were used to educate new doctors and surgeons. Scansite technology collects over 5 million points per scan, which gave us all of the detail we would ever need. That same attention we give to Rodin, we give to all of our clients. We know that's how exceptional results happen." With its internationally acclaimed studio in the San Francisco Bay Area, Scansite is a full-service 3D scanning, 3D metrology, inspection and reverse engineering company. With the expertise, experience and attention to detail necessary to cater to world-class museums and legacy car owners, Scansite provides meticulous and state of the art services to every industry. With more than 20 years of experience, Scansite helps its customers surpass their 3D scanning goals. For more information, visit www.scansite.com or call (415) 488-9500.